Although I live in North Carolina, I try to visit the orchard and see my parents frequently. Earlier this year. I brought home some Jonathans, my favorite cooking apple. 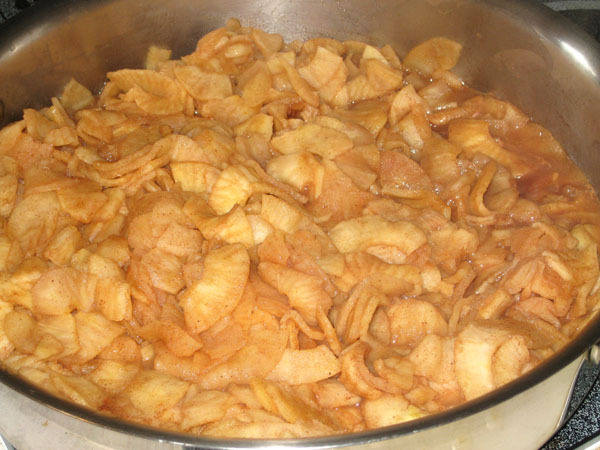 I used a half-peck bag to make a large skillet of fried apples. They are wonderful warm served over vanilla ice cream. They are also good in fried pies or even just spooned into a small flour tortilla, folded over and fried in a skillet with butter. I melt 1/2 to 1 stick of butter in a large, heavy skillet. This can be reduced or eliminated by using some cider or apple juice. In a large bowl, I mix the apple slices with cinnamon and sweetener. My preference is a mix of white and brown sugar. When I am making it for just me and my husband, I use Splenda since we have to watch our sugar intake. I use Stevia for a lot of things, but it doesn’t work too well for these apples. I like to add a few Red Hots ( candy ) to my skillet of apples. My grandson loves them and so do I. Very pretty! That’s a good option, Sherry. Thanks for sharing.